We are excited to welcome Brigg Patten as a Body Language in the Bandwidth guest blogger. From time to time new terminologies work their way into the business world. And one of the hottest terms among business trainers these days is “gamification”. Simply stated, gamification is the practice of integrating game principles and mechanics into a non-game experience.For business trainers it’s about adding elements of gaming into instructional strategies for more effective training and learning. 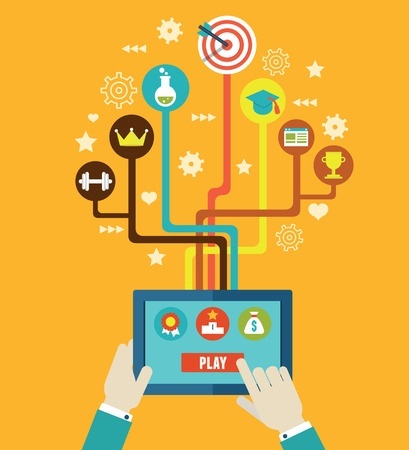 Properly implemented, gamification can increase employee engagement, motivation and participation within the training experience, to the benefit of the employee and the company. As far as gamification examples go, here are seven companies that are using this training tool within their business environment correctly. To maintain the consistent high quality standard of food and service that has made Domino’s a major player in the competitive pizza pick-up and delivery arena, the international fast food chain needed to train new employees quickly and effectively. In answer to this problem, Domino’s created the Pizza Maker course, a training strategy that uses simulations and gamification to engage, assess and reward employees during the learning experience. By including elements that encouraged employees to try to improve past scores, the games helped new employees master the menu sooner and make more accurate pizzas faster, thus decreasing onboarding time. In today’s socially connected world, those organizations that are better equipped to leverage social media stand to gain a significant competitive edge. In recognition of that fact, Cisco invested in a global social media training program designed to build and boost the social media skillsets of the company’s employees and contractors. However, the product of this ambitious effort was a program consisting of 46 courses with no clear starting point. As a solution to this problem, Cisco gamified its social media training program by introducing three levels of certification--- Specialist, Strategist and Master---that participants could shoot for. Cisco also introduced four sub-certification levels for HR, external communications, sales, and internal partner teams. To foster an atmosphere of healthy competition and collaboration, Cisco also brought team challenges into the mix. The results? As of this time last year, over 13,000 courses had been taken and over 650 Cisco employees had been certified. Recognizing the power of engaging its already substantial customer base to become brand advocates and to create valuable branded content, Samsung launched a gamified social loyalty program called Samsung Nation. When customers register a product on Samsung.com, they are automatically entered into a sweepstakes for a chance to win other Samsung products. Customers are also rewarded for reviewing products, participating in Q&A discussions with other users, watching videos, and otherwise getting engaged in the Samsung community. As a reward for their participation in the program, users are awarded with badges as they progress through various levels of achievement. Since implementing Samsung Nation, Samsung has experienced a 66 percent increase in site visitors, a 30 percent increase in comments, and a staggering 500 percent increase in customer product reviews. With years of knowledge and experience, senior executives play a valuable role in today’s organizations. But they can also be averse to new training programs. This was Deloitte’s dilemma when the organization implemented a leadership training curriculum for senior execs, and then had trouble motivating them to start and complete the program. Deloitte’s solution was to introduce gamified elements into the program, such as badges, leaderboards and status symbols that encourage execs to participate in a status oriented competition with their peers. Only three months after gamification was implemented, the time to complete the program dropped by 50 percent, with a nearly 47 percent increase in the number of users that return to the site daily. In fact, many participants described the training program as being “addictive”. Faced with countless language localization needs for its vast line of products, the software giant needed a way to ensure that language translations were accurate and made sense. To accomplish this formidable task Microsoft built a “Language Quality” game using its own Silverlight application. The game allowed Microsoft staffers around the world to view screens and check for language accuracy. To make sure that its employees were engaged and paying attention, Microsoft even threw in some intentionally poor translations. The game attracted 4,500 users who reviewed a total of 500,000 screens and made translation corrections or improvements based on their native tongues. The most notable participant was Microsoft Japan. In an effort to up community engagement in its internal social network, Bluewolf, a New York based management consulting firm, implemented a gamified version of the Salesforce.com Chatter platform. This change allowed employees to get points for posting comments, publishing blog posts, and sharing reports on outside social networks. As a result, Bluewolf experienced a 57 percent increase in community engagement. In an effort to encourage employees to submit travel expense information in a timely manner, Google gamified the expense process. Instead of just reporting expenses, those employees who didn’t spend their entire travel allowances got to choose whether to be paid the leftover money in their next paycheck, to save it for a future trip, or donate the funds to their favorite charity. Within six months of launching the gamified travel expense system, Google’s employee compliance rate reached 100 percent.